Thurman now owns two championship belts. These are the finest days to be Keith Thurman. His critics have been silenced. He has beaten up the finest his weight division has to offer. He is respected, admired, still undefeated. He is happy, healthy, still hungry. He has enough money. From now on, it's about legacy. Once, he was the little boy chasing champions -- Winky Wright, Jeff Lacy -- around the ring. In the future, he may be a boxing commentator; he's certainly analytical enough. But for now, at age 28, he is twice a champion. Try him if you dare. Watch Thurman skip around the gym, his feet light, his eyes clear. He is tougher than most, smarter than the others. The world may be chasing him, but it's going to have to get up a little earlier if it's going to catch him. He has spent most of his life in the ring, dancing and jabbing and being better than the other guy. He has put in more time than he has left; Thurman seems aware of that, aware that he has only so much time worth claiming. He seems determined to squeeze whatever he can out of the days he has left. Other critics, the fathers of the men he has beaten, keep yammering. Thurman grins and shrugs it off. Shawn Porter's dad got mouthy, doubting an injury that caused a delay in their fight. And Thurman won. Danny Garcia's dad got mouthy — with a racial tinge. Thurman won that one, too. The combined losses of the last two men he has fought? One. O-n-e. Porter had been beaten once coming in; Garcia not at all. And Thurman beat them both. Oh, it's been awhile since the word called him One-Time. 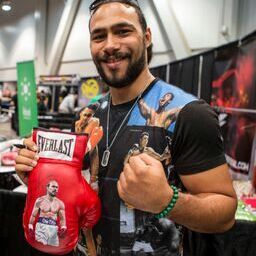 Thurman hasn't had a clean knockout since 2013, when he left Diego Chavez on the mat. Since then, he's won seven fights by decision or — in the case of Luis Collazo – when an opponent had to retire because he was cut. The reason, undoubtedly, is superior competition. Garcia was stubborn, and Porter fought hard. But Thurman had enough to take them both. Maybe the day will come when someone has enough for Thurman; it hasn't come yet. Who gets the next shot? Will it be the winner of the Manny Pacquiao-Amir Kahn fight? Maybe the winner of Kell Brook and Errol Spence, Jr.? A rematch against Garcia? Against Porter? By this time, you can trust Thurman to fight whomever. "If you can beat me," he says often, "then come and beat me." The guy doesn't pad his numbers with palookas. He's fought the best in a very good welterweight division. He isn't in pre-season anymore. Boxing is a difficult sport. It's the rare sport where the intent, the ultimate intent, is to hurt your opponent as badly as you can. And he you. So every day, you put your face on a tee and let people swing away. Oh, you've seen the old fighters, the guys with broken noses and slurred speech, but you try not to think about it. Still, you know. Somewhere out there, sometime, you'll get yours. For Thurman, though, it might be a while. He has that rare combination of the ability to think and the ability to punch. He can talk to you about world religions or boxing history, about philosophy and life. I thought the difference for Thurman against Porter was intelligence. Thurman knew he had built a huge lead, and he went to prevent defense. As always, that can make you look weak, tentative. And some onlookers thought that Thurman ran too much in the later rounds. But Thurman is a bright guy. He knows how to adapt in the ring, how to read his opponents. Boxrec already says that Thurman is the eighth-best pound-for-pound boxer. Both Boxrec and Ring Magazine have him as the second-best welterweight going. The Transnational Boxing Rankings Board had him third before he beat Garcia. All-time? No, not yet. The welterweight division is one of the best in boxing history, from Ray Robinson to Sugar Ray Leonard to Thomas Hearns to Kid Gavilan to Emile Griffith to Floyd Mayweather to Joe Walcott. Before he's done, Thurman wants to be on that list. Maybe he can make it. In the meantime, it's a good life. Watch Thurman dance across the ring with his dog giving chase. Watch his relationship with Dan Birmingham. Watch Wright grin as he sees Thurman go through his paces. It is here, in the pale yellow boxing gym, in the middle of the heavy bags, that Thurman stays grounded. Oh, he could be somewhere else, and he could trade his life for another. But he is at home here. This is his joint, after all. And this is his time. Try to take either one away from him. He dares you. I thought 8 rounds to 4 was a fairly good call, 116-112. I do think Keith will have to do more if he ever wants a PPV fight for the really big bucks, but then he’s the one with more titles than anyone, so maybe they will have to come to him. Wish him the best, know Dan, he’s a great coach and mentor for him, so expect they will do fine. Nice article, Gary, I kind of knew you would do a write-up of the fight. Thanks. I’ve gotten to know Keith (and Dan). I think they’re both great. I agree that the showman in Keith trails the boxer. It might cost him a payday fight at the end of his career. But if he gets even more belts, he’ll be fine. Previous post: Random thoughts: Is the media Tiger’s problem?